Jack Handey, an American humorist , his earliest writing job was for a newspaper, the San Antonio Express-News. He lost the job after writing "an article that offended local car dealerships". His first comic writing was with comedian Steve Martin. 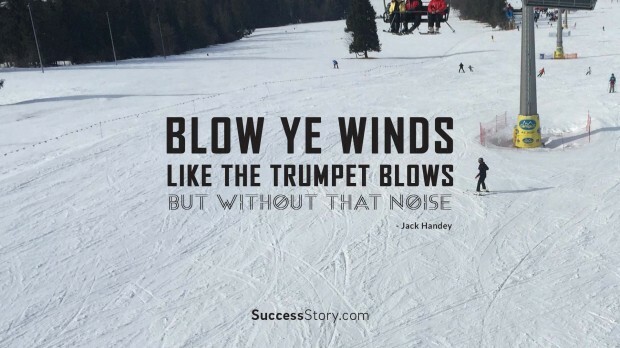 "Blow ye winds, like the trumpet blows, but without that noise "
The first of Jack Handey's Deep Thoughts one-liners were to become Handey's signature work, notable for their concise humor and their outlandish hypothetical situations. The one-liners proved to be extremely popular on TV show. Peaceful easy listening music would play while the screen showed soothing pastoral scenes, much like a relaxation video. They became an enduring feature and often had multiple Thoughts in each episode . This made Handey a well-known name. Handey published his first collection of magazine humor pieces in April, 2008 , "What I'd Say to the Martians and Other Veiled Threats". With absurdist musings such as these, Handey established himself as the strangest of birds: a famous comedian whose platform is not the stage or screen, but the page. His humorous and funny quotes are good to make any person smile if not laugh at most of them. The one-liners sweetly describe the most serious situation which will carry your thoughts from the main topic to eventually smile or laugh of course. Like he has very nicely explained that before you criticize someone , take a walk for a mile in their shoes thereby gaining a mile between you and him and also having his shoes on your feet. This may sound very simply put but definitely has a meaning hidden that you avoid criticizing the person and walk away with his shoes too..